I’m taking a small break from minor league baseball to focus on some minor league hockey. Why would I do this, you ask? Easy, when my own Grand Rapids Griffins captured the Calder Cup last night with a 5-2 win over the Syracuse Crunch. The Calder Cup is awarded to the playoff champion of the American Hockey League, which is comparable to Triple-A in baseball. The Griffins won the series four game to two over the favored Syracuse team. Grand Rapids won the first three games of the series, but the Crunch battled back to win two and bring the series back home. It would have been nice to have won it on home ice at Van Andel Arena, but a championship is special no matter where it’s won. 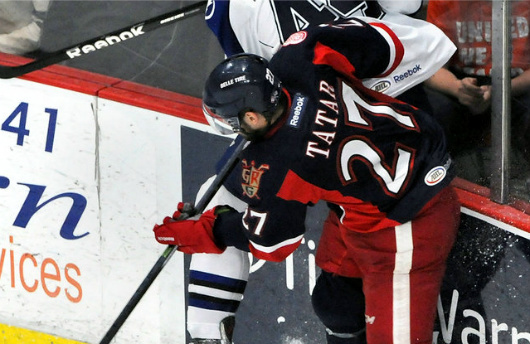 Griffin captain Jeff Hoggan accepted the Cup at center ice, and Tomas Tatar was awarded the Jack A. Butterfield Trophy as the series most valuable player, scoring 16 goals and 21 points in 24 games. In net, Petr Mrazek made 24 saves for the win. First year head coach Jeff Blashill made a fine showing also, and is a native of our little town of Sault Ste. Marie here in the U.P. This is the first championship in the 17 year history of the Griffins, and 27 years of pro hockey in Grand Rapids. To celebrate, more than 4,000 fans were in attendance at Van Andel Arena this evening to see the Griffins and the Calder Cup. The team was also able to thank their fans. We knew this would be a special season when we saw them play in February, and they looked very solid. I would love to see the Whitecaps pick up on this, and have the Griffins honored at one of their games. They could even have a championship puck give away or something, or have the Calder Cup on display. Anyway, this is very good for my hometown of Grand Rapids. Congrats to the Griffins, and also to Syracuse on a great season. I wish they’d show more of the AHL on tv. You’d think up here they would, but the NHL takes a lot of coverage. Congrats on that win. I was pulling for Syracuse, but I think the AHL is a great league because for many, the Calder Cup is the only trophy they’ll win. I don’t really have a favourite team other than the Baby Sens, but I cheer for St. John’s, Toronto and Syracuse. Thanks, I’m glad GR finally won it, since it’s their first championship. At least they showed the finals on AHLlive , so I could watch on the computer, but they should be televised. As a Crunch fan it was hard to see our guys lose at home and especially heartbreaking to watch them watch the Griffins celebrate (and rightfully so, as I’m sure the Crunch would’ve celebrated just as hard if they had won). But at the end of the day, the Griffins figured out the Crunches game and they capitalized on it backed by a great young goalie. I was at all the games in the playoffs and the season and it was some of the best hockey I saw full of memorable moments (we even got a bonus 2 extra minutes in game two!). Congrats to the Griffins on a well earned Calder Cup victory. The Crunch showed a lot of heart and courage coming back to win those two games in GR. They never gave up, and deserve much respect. I wish I could have made it downstate to any of those games. The Crunch should see more success, though, with Steve Yzerman (my favorite player ever) as the Tampa GM. I did see a couple of Chiefs games last spring and had a nice time in Syracuse then.